We are nurturing a nation of little geeklets. That’s not a judgmental assessment on the state of child-rearing. It’s just a matter of fact (a rather fantastic one, if you ask me). After all, this is a world that spawned teens like Nick D’Aloisio, Eesha Khare and Jennie Lamere, and produced coding apps for children. So what’s next? How about an augmented reality app and hardware kit that helps kids understand and build electronics? Now here’s something with big potential for awesome. Since electricity is invisible, circuit paths can be tricky for little ones (and even some grown-ups) to understand. Well, thanks to the AR-enabled LightUp kit, that doesn’t have to stymie budding makers anymore. Users can snap together the magnetic components, and using the mobile app, they can see how electricity moves through the system. All they need to do is take a photo with the phone, and LightUp displays animated lines that can show whether the piece is functioning fine or if something’s misaligned or otherwise gumming up the circuit loop. The parts vary, depending on the package. The $99 bundle includes an Arduino micro-controller, magnets, resistors, light sensors and LEDs. 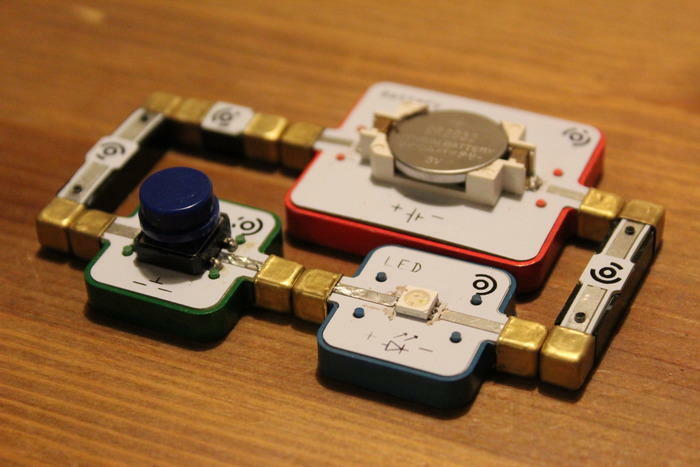 There’s also a cheaper $39 kit with fewer components, but enough to build things like a night light, morse code buzzer or an alarm that triggers whenever a lunch box is opened. (I could use something like that on my fridge. My husband and I love to snack late at night.) And more kits are available at a range of price points. But the cool factor is the AR feature, which is something competitors like Little Bits lack. The cost of entry is also lower than that $89 to $149 price point. But either way, a young (or older) electronics enthusiast have plenty of kit to satisfy their maker ambitions. Paired with 3D printers, which are becoming incredibly affordable, anything’s possible. Imagine DIY, wholly custom-made gadgetry. If people grow up learning how to tackle circuits and printing out gear, some day consumers won’t need to buy droolworthy devices. They’ll just build their own at home. A prototype for the LightUp app is already available in Google Play, and a production app will be available for Android and iOS when the Kickstarter’s over and the kits ship in December. For a closer look at how this works, hit the vid below.